The breadth of intelligent applications the BigML platform can support spawn many new opportunities for BigML partners to get involved in delivering Machine Learning-based solutions. Our certifications are perfect for software developers, system integrators, technology consulting, and strategic consulting firms to rapidly get up to speed with Machine Learning and the BigML platform as they acquire and grow their customer base. Master Large-Scale Machine Learning Solutions. In order to be eligible to enroll into the BigML Certified courses you must show certain level of proficiency in Machine Learning, BigML Dashboard, BigML API, and WhizzML. The following getting started assets will get you up and running in no time: ML 101, Tutorials, API documentation, and WhizzML. 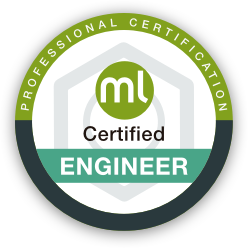 This certification course prepares analysts, scientists, and software developers to become BigML Certified Engineers. It consists of 8 online classes of 1.5 hours each. Evaluation will be based on solving a set of theoretical questions and exercises presented during the course. The modules listed below will consist of 2 sessions each to complete the 8 online classes. Understand how to parameterize supervised and unsupervised methods to achieve better performance. Learn how to compose multiple methods together to better solve modeling problems. Supervised (Models, Ensembles, Linear Regressions, Logistic Regressions, Deepnets, Time Series, and OptiML) and Unsupervised (Cluster Analysis, Anomaly Detection, Association Discovery, and Topic Modeling) methods. 1-click Model, 1-click Ensemble, 1-click Linear Regression, 1-click Logistic Regression, 1-click Deepnet, 1-click Time Series, 1-click OptiML, 1-click Cluster, 1-click Anomaly, 1-click Association, 1-click Topic Model. Decision Trees: Node threshold, Weights, Statistical Pruning, Modeling Missing Values. Ensemble Classifiers: Bagging (Sample Rates, Number of Models), Random Decision Forests (Random Candidates), Boosting. Logistic Regression: L1 Normalization, L2 Normalization, Field Encodings, Scales. Deepnets: Topologies, Gradient Descent Algorithms, Automatic Network Discovery. Time Series: Error, Trend, Damped, Seasonality. Evaluation: How to Properly Evaluate a Predictive Model, Cross-Validation, ROC Spaces and Curves. OptiML: How to optimize the process for model selection and parametrization to automatically find the best model for a given dataset. Fusion: Combination of models, ensembles, linear regressions, logistic regressions, and deepnets to balance out the individual weaknesses of single models. Clustering: Number of Clusters, Dealing with Missing Values, Modeling Clusters, Scaling Fields, Weights, Summary Fields, K-means vs. G-means. Association Discovery: Measures (Support, Confidence, Leverage, Significance Level, Lift), Search Strategies (Confidence, Coverage, Leverage, Lift, Support), Missing Items, Discretization. Topic Modeling: Topics, Terms, Text analysis. Anomaly Detection: Forest Size, Constraints, ID Fields. The lecturer will be available between 08:00 AM and 08:00 PM PT. Please send an email to education@bigml.com for other time ranges. Proficiency in using BigML's API and client-side tools to create ML resources. Integration and automation of the workflows needed put a ML solution in production. Basic knowledge of BigML and its resources (UI-level familiarity is enough). Basic programming skills (some examples are in Python, so knowledge of the language will be a plus). Domains (bigml.io vs. Private Deployments). Resources: Common information, Specifics, Listing and filtering. The lecturer will be available between 01:00 AM and 01:00 PM PT. Please send an email to education@bigml.com for other time ranges. Data is typically: scattered, unclean, and imperfect. How to make it ML-Ready. Once data is ML-Ready, why/how to make better features. Not all features are good. How to choose and what to watch out for. Familiarity with: SQL, Python / Pandas, CSV formatting. Cleansing Missing Data, Cleaning Data, Better Data. Transformations outside and inside BigML: SQL-style queries, Denormalizing, Aggregating, Pivoting, Time windows, Updates, Streaming Data, Images. Principal Component Analysis (PCA): Dataset transformation and dimensionality reduction. Auto Transformations: Date-time parsing, LR/cluster missing, LR/cluster auto-scaling, Bag-of-words (Language, Tokenization, etc). Manual - Flatline: DSL for feature engineering, Basics (s-expressions/formulas, Literals, Counters, Field Values / Properties, Strings, Regex, Operators), Limitations. Numerics: Discretization, Normalization, Z-score, Built-in math functions, Type-casting, Random, Shocks, Moving averages. Date-times: UI timestamp, Epoch, Moon phase. Text: JSON key/val, Topic distributions. The lecturer will be available between 10:00 AM and 10:00 PM PT. Please send an email to education@bigml.com for other time ranges. Proficiency in using BigML's DSL language, WhizzML, as a server-side tool to automate ML-workflows in a scalable, replicable and shareable way. Basic programming skills (knowledge of some language of the LISP-family and/or WhizzML will be a plus). The lecturer will be available between 03:00 PM and 09:00 PM PT. Please send an email to education@bigml.com for other time ranges. This certification course prepares BigML Certified Engineers to become BigML Certified Architects. Once you have successfully become a BigML Certified Engineer, you are eligible to enroll into the BigML Certified Architect course. The certification process consists of 8 online classes of 1.5 hours each. Evaluation will be based on solving a set of theoretical questions and exercises presented during the course. The modules listed below will consist of 2 sessions each to complete the 8 online classes.